The Revolver Drill Brush is designed to brush away dirt and grime with the help of your cord/cordless drill. Just mount the Revolver Drill Brush in your drill using the 5/16" universal galvanized steel shaft, and you'll be cleaning and scrubbing easily with minimal effort. 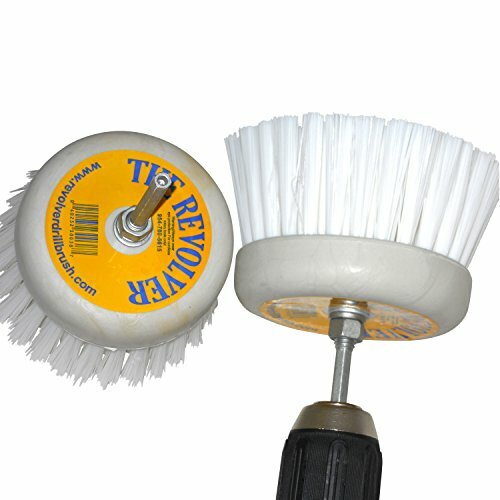 Just chuck onto any drill, and let the revolving brush do the cleaning for you with its power scrubbing action. The drill brush saves you time and effort! Just attach the Revolver Drill Brush to your drill and watch the grime disappear! Don't just clean it, drill brush it! Spin & Brush Away Dirt And Grime On Tires, Rims, Carpet, Floor Mats, Upholstery, Boats, Trucks, Walls, Floors, Tile, And More! If you have any questions about this product by Revolver Drill Brush, contact us by completing and submitting the form below. If you are looking for a specif part number, please include it with your message.